Sri Lanka’s first ever dedicated performance arts center for tourists is to open on the banks of the historic Diyawanna Oya on the outskirts of Colombo next month. The state of the art Sri Dharanee Performance Theatre fills a huge vacuum in Sri Lanka’s cultural entertainment sector, where tourists will be treated to high quality performances of traditional Sri Lanka dance forms on a scheduled basis. Located in a scenic spot ideally suited to the arts, the massive facility has been constructed on the lines of similar attractions in cities such as Bangkok, Singapore, and Tokyo. Combined with the charm and scenic beauty of the historic Diyawanna Oya, the Waters’ Edge Recreational Complex, restaurants and adjacent shopping attractions, Sri Dharanee Performance Theatre will help create a tourism enclave in close proximity to Colombo. “Today tourists have very few evening entertainment options in the city of Colombo. Other than casinos and a few clubs, there is no quality, wholesome entertainment on offer for tourists. Therefore the Sri Dharanee Performing Arts Center has come in at the right time. I’m sure the quality entertainment lineup that seeks to highlight our ancient history and dance forms will be appreciated by the tourists who visit the city,” said Minister Amaratunga. The Minister observed that the new venture was in line with the Prime Minister’s vision to add value to Sri Lanka’s tourism product portfolio. “Prime Minister Ranil Wickremesinghe has instructed that every effort must be made to develop tourism. The fact that this facility will be operational by the end of this month is an added benefit in projecting Colombo as an entertainment hub for tourists,” he said. 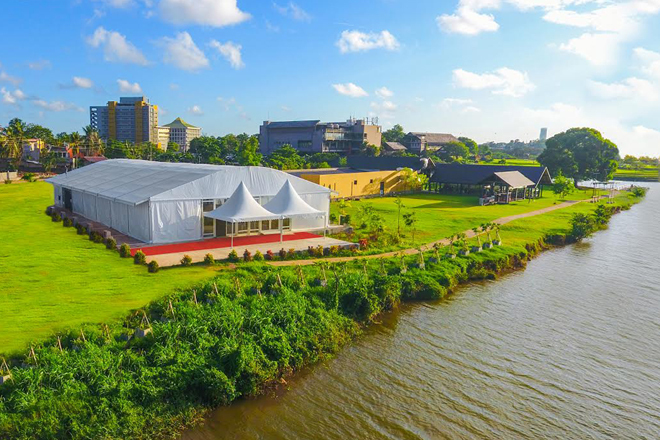 The Sri Dharanee Center is capable of accommodating more patrons than both the BMICH and Nelum Pokuna and therefore is well placed to host large MICE events. It will provide a platform for local artistes to perform and earn a livelihood while also portraying Sri Lanka’s rich culture, history and traditions to foreign visitors. “I want to thank the Minister of Megapolis for his cooperation and encouragement in making this project a reality. The owning company of this venture must also be commended for showing the way for tourism development in a meaningful and sustainable manner,” Minister Amaratunga said.